Our Chicago emergency business litigation attorneys have been providing legal counsel to businesses, business owners, and professionals in the Chicago area for over a decade. Business litigation is a central focus of our law practice and our corporate lawyers have years of experience with prosecuting and defending a variety of business dispute matters that require immediate attention. If you or your business has been named in a lawsuit, a lawsuit has been threatened, or you would like to initiate a lawsuit, contact our Chicago law office immediately for a free consultation to discuss your business litigation matter – 312-789-5676. Emergency business litigation matters arise frequently between members of a limited liability company, shareholders of a corporation, partners of a partnership, or employees of a company. For example, many Chicago businesses require employees to sign noncompete, nosolicitation and confidentiality agreements in order to protect the business from competition and dissemination of confidential information, such as trade secrets. When an employee leaves the company to pursue his or her own startup business venture, oftentimes that employee will ignore past contractual business agreements he or she may have executed with a previous employer. On the other side of the equation, when an employee leaves a company in which he or she may be subject to certain restrictive covenants, there is an issue as to whether these restrictive agreements are enforceable in the state of Illinois. These situations are extremely common in the corporate arena. Our business litigation lawyers are well equipped to expedite certain remedies on behalf of the client to immediately address the emergency litigation matter – see discussion on emergency injunctions below. 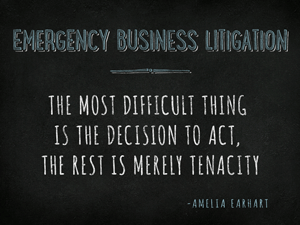 Most often the goal of an emergency business litigation lawsuit is to prevent an imminent harm from occurring or from continuing to occur, or to quickly and efficiently minimize the damage. Our Chicago emergency business litigation lawyers offer clients several ways to address and handle legal emergencies that require immediate attention. To add on to the example above, when an employee or business partner acts improperly, breaches his or her legal obligations or otherwise damages the business, the company may have the right to protect itself by seeking emergency relief in Illinois state of federal court (i.e. by filing a lawsuit). The company may also seek emergency resolution through arbitration or mediation. Emergency business litigation matters often require immediate attention because, more often than not, a party cannot wait months or years for the resolution of a lawsuit while continuing to be harmed by the other party’s violations. Additionally, often the remedy of monetary compensation is not the immediate goal. The goal of emergency litigation is to prevent an imminent harm from occurring or from continuing to occur, or to quickly and efficiently minimize the damage. In other words, the goal clients often seek to achieve is: 1) a court order forcing a party to do what he or she is obligated or has a fiduciary duty to do, or 2) a court order preventing a party from continuing to commit violations or damage to the company. A temporary restraining order (TRO) is a court order of limited duration. A temporary restraining is a type of injunction whereby a court will order a party to maintain a certain actions (or to immediately cease certain actions) until the court has an opportunity to hear further evidence and arguments from the parties. In Illinois, a temporary restraining order can be imposed where there is: (1) a clearly ascertained right in need of protection, (2) irreparable injury in the absence of an injunction, (3) no adequate remedy at law, and (4) a likelihood of success on the merits of the case. A preliminary injunction is an injunction entered by the court prior to a final determination of the merits, in order to restrain a party from continuing certain conduct or to stop a party from taking certain actions that would cause damage to another party. A preliminary injunction is often referred to as an extraordinary and drastic remedy that should apply only in those situations where an extreme emergency exists and where, in the absence of an injunction, serious and irreparable harm would result to the party seeking the injunction. A permanent injunction extends or maintains the status quo indefinitely. Unlike a preliminary injunction which the court issues pending the outcome of a lawsuit, a permanent injunction is of unlimited duration and alters the status quo permanently. In other words, the court will determine the rights between the interested parties through a final court order. A permanent injunction will be a final order from the court that a person or business refrain from certain specified actions. The purpose of a declaratory judgment (often called declaratory relief) is to allow the court to address an issue before an actual business dispute arises. A declaratory judgment allows business disputes to be resolved before the parties initiate litigation. The remedy of declaratory judgment is meant to afford security and relief against uncertainty with view toward avoiding litigation, not toward aiding it. Our Chicago emergency business litigation attorneys have decades of combined experience with handling many different corporate litigation matters throughout Illinois. To schedule a consultation with one of our corporate litigation lawyers today, please contact us online or give us a call at 312-789-5676.